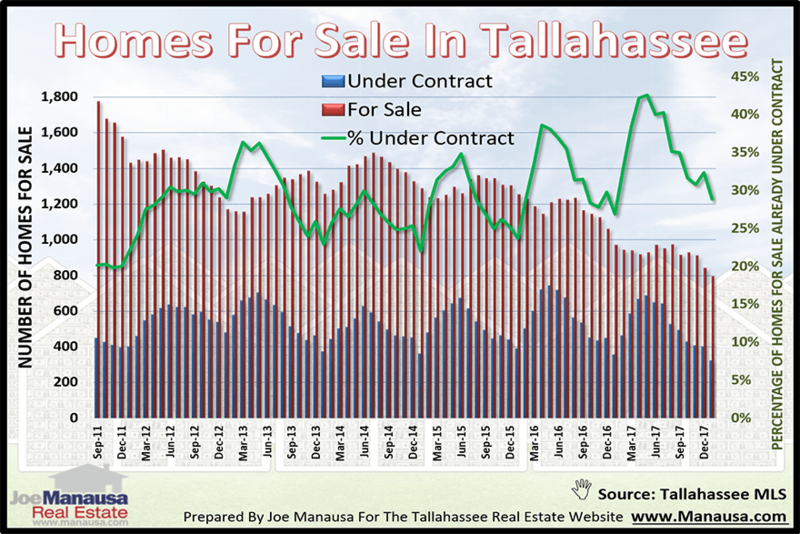 There is an obvious pattern that has emerged regarding houses for sale in Tallahassee, and the prudent homebuyer should be paying attention. For three consecutive years, there have been more homes available for purchase in January than there have been in February, March and sometimes in April. As you will see with the houses listed below, they are likely the best deals you'll find all year. In other words, if you plan on moving soon, your largest selection of homes will be found right now! Our graph above shows the number of active listings at the start of each month, where homes under contract are shown in blue and homes not-under-contract are shown in red. The ratio of homes under contract to all active listings is shown in green and measured on the right vertical axis. You should note that the lowest percentage of homes under contract has occurred in January for the past four years. Relative to the number of sales that occur each month, this means that buyers have had the most homes per buyer available in January than in any other month of the year. We won't be seeing a buyer's market for most price ranges for several years, but January is as close as you will come to one this year! When you look at the list of houses for sale in Tallahassee above, you'll notice that we have included ones that are already under contract. These are homes that are arguably no longer available because a buyer has come to terms with the seller, but in this market where inventory is thin, buyers might want to get in line in case the existing buyer fails to close (not uncommon). Whether you plan to write an offer immediately, or if you are merely considering a move in the next year or so, you should take advantage of our home buying process as your first step. At Joe Manausa Real Estate, we have a team of home-buying specialists, professionals who will sit down and put you on a money-savings path. You'll be amazed at all the mistakes that unguided buyers make when they first start thinking about buying a home. And this includes seasoned buyes too! The tools that can be used and the best techniques for acquisition change regularly (which is far more often than most people buy a new home). So give us a call at (850) 366-8917 or drop us a note and we'll schedule a time to prepare you for the best home purchase you've ever made. You'll love your new home and you'll save money buying it, how great is that?